BrianQuan.com - IE6 almost dead; But is the life of a web dev any easier? IE6 almost dead; But is the life of a web dev any easier? So at long last, this year Internet Explorer 6 is finally dying! At the moment, with only about 8% market share remaining, the long awaited death of IE6 shall be heralded by all web designers and developers out there. 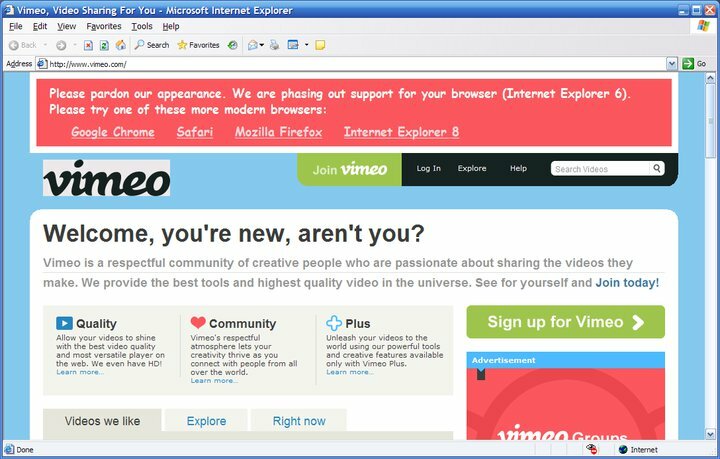 Major web services have already stopped supporting them (such as Vimeo and Youtube). Heh, one of my favorite responses to IE6, the "Shockingly Big IE6 Warning" Wordpress Plugin. So hooray! No more headaches of trying to make websites compatible on IE6 - but does that necessarily mean the life of a web designer is any easier now? Maybe not. Because today, we don't only have to test on web browsers on computers, we now have the plethora of mobile devices that have internet access. Perhaps even make an entirely different interfaces for mobile and touch screens. Although, I do concede to the fact that most of the latest internet capable mobile devices are pretty good at adhering to web standards - especially in comparison to IE6. So in short, IE6 is a huge headache lifted from the web devs shoulders, but more technologies are filling its place (much smaller headaches but more numerous).